CorkSport is proud to announce the first adjustable weighted shiftknob for Mazda enthusiasts. The CorkSport Adjustable Aluminum Shiftknob allows for smooth throwing shifts, and a clean style to complement your Mazda or Mazdaspeed. At its lightest, weighing in at 175 grams, and adjustable up to 320g. Engineered from T6 Aluminum with a color selection of a sleek black or a deep blue finish. Tailor your weight to your driving style for perfect smooth responsive shifts. The CorkSport adjustable shift knob was designed with customer collaboration and a big thank you to Robbie Robbinson. Adjustable: Adjustable weights, allowing you to customize the weight between 175g up to 360g to tailor your shift throw. Longevity: Manufactured from high grade aluminum then anodized in a deep blue or sleek black for a long life and incredible feel. 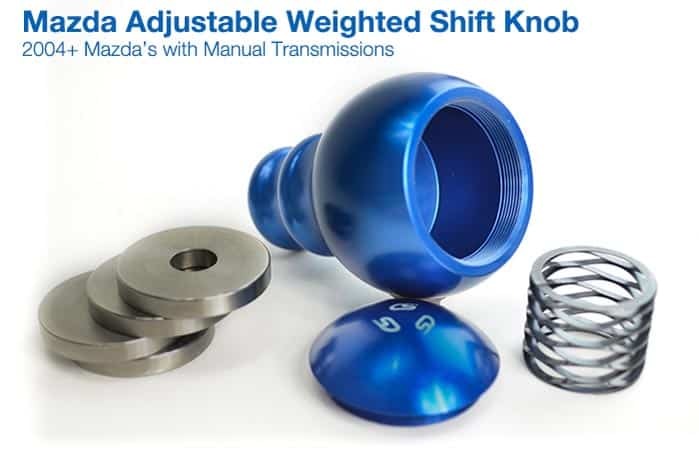 Versatile: Easy OEM replacement of the Mazda manual transmission shift knob without screws or adapters. Size: Overall height is 3.150 inches and 2.066 inches at its widest. Adjustable: For a greater feel of your shifts, adjust your weights to the lighter side, as low as 175 grams and feel the intricate shift points as you flow through the gears. For those that like them heavy, you can max it out to 320 grams, giving you smooth shifts and falling into gear as you are shifting up or down through the gears. Ease of Use: Extremely easy to install, your Mazda/Mazdaspeed will be ready for weighted shifting within minutes. CorkSport Service and Support: Receive full color installation instructions, all of the needed installation hardware, and knowledgeable telephone support. The knob should come with a cute sock so that my hand doesn't get a (hot) or (cold) surprise every time I return to the car after a few hours. I experimented with 1-3 washers and have settled on 2. The result is lighter than the OEM handle and much easier to shift with confidence. PS It'd be challenging to screw down the top with all 4 washers in place. The shift Knob looks and feels great compared to OEM. Just like others have stated though, you might want cover it with a towel or something if you're leaving it parked on a sunny day. Also, I rarely use my whole hand when driving on the streets to shift I just use my palm and suttle movements, but just using your Palm when switching to 5th may cause your hand to slip (because of how smooth the knob is) and miss the gear. Amazing product. Makes shifting feel 100% better. Just keep something to cover it if you're parking in direct sunlight to save yourself a burning surprise haha. This knob looks and feels really impressive, however it become as hot as pan when car standing under the sun for a long time and I am sure it will be too cold at winter due to aluminium used. However I am still super satisfied, just need to take gloves when it is too warm or too cold. Looks great and is much easier to handle than the OEM knob. i have yet to see another manufactuer to offer adjustable. i just put this on my 2011 2.5 3. you wouldnt think a shift knob would make this much difference in your shifting...but it really does. very well made. easy to adj. would recomend to anyone. the design fits your fingers and palm perfectly for a great shift every time. plus changes the look of your interior. i have already had 3 people comment on it. how nice it was how great it felt. dont wait. your mazda wants this. Incredible compared to the OEM knob. Perfect fit, perfect feel. Another great product. Would this fit a 2007 MS3? Does this shift knob come avaliable in blue still? It shows it in blue in the pictures but theres no option for it. What is the thread size and what is the minimum distance from the top of the knob to the top of the end of the shifter thread (eg. how short can i make it)? Does it come in blue as shown in the picture? Will this fit an AT? This will not work on an Automatic Transmission. Is there a plan to have a red color option for this knob? if, so when? and I am sold! We are not planning a red option. How much gap is for the 2014 Mazda 3? The gap is about 1/4-1/2 inch.